As game manufacturer Hasbro says, Clue is "the mystery you love to solve again and again." Introduced in 1949, this classic detective game has moved beyond the board and into the virtual world. A spinoff game is available for online play and there are also classic online games you can play to enhance your experience. When you head to arcadespot.com, you can find Clue listed under arcade games. The game takes 10 seconds to load and requires Adobe Flash to play. The site is easy to navigate and the game loads very quickly. An ad may play right before your game begins, but it only lasts about a few seconds. A maximum of six people, either human or computer-controlled, can play at a time. Use the arrow keys to move through the mansion and collect clues. The "Z" key on your keyboard acts as the main action button for rolling the die and selecting menu items. In this version, your goal is to figure out who murdered Mr. Boddy and what weapon was used to do so. Once you have enough clues, suggest who the murderer is. Play the classic game of Clue on letsplaysega.com. Make sure Adobe Flash Player is enabled in your web browser. The site is simple, easily searchable, and the game plays through seamlessly. You do not have to register to begin the game; just click on the gameplay area and press the "enter" key. You can also cast your computer or laptop screen to your television and use your video game controller to play this version. Some people have mentioned having problems with their computer controls. If this happens to you, you may consider trying to use a gamepad. Along with traditional wired options, there are great wireless options that can be used when playing games on your television, computer, tablet or phone. Use the arrows to move your player around and try to solve the murder mystery. The controls are based on the classic Sega gamepad. The A, B, and C buttons on the original gamepad correspond to the X, C, and V keys on your computer keyboard. Begin the game by pressing the B key on your keyboard, which acts as the equivalent of the "start" button on a gamepad. Gather clues throughout the house. Take your best guess as to who the murderer is! When you head to snesfun.com you can play older Super Nintendo games online. Simply click on the "Play the game" button to get started, but make sure that you have enabled Adobe Flash Player in your web browser. This site also lists the most active players for each game. To access more games and have your score posted on their site, you will need to register. You can use Google, Facebook or Twitter to login if you don't want to create a new username or password. Like the classic game, you are trying to figure out who Mr. Boddy's murderer is. Use the arrow keys to move around the house and collect clues. The A and S keys on your keyboard correspond to the A and B buttons in the game. The Enter key is your start button and the space bar is your select button. After you have gathered enough clues, try your hand at pinning down the murderer. Hasbro has made a spinoff version of the classic game available online. Clue: Secrets & Spies is a hidden objects adventure game that can be played for free at Pogo.com. The game can be played alone or with friends if you register at Pogo. By registering with the site, you can also save your scores, earn prizes or chat with your friends. In this covert, spy-themed game, you try to find various objects while using your detective skills to track down Agent Black and his C.L.U.E. (Criminal League for Ultimate Espionage) operatives. The game is divided into 60-minute episodes, like a TV show. The episodes can be paused and you can play them in whatever order you choose. For each episode, you will be provided a list of objects that are cleverly hidden in the scene. Simply click on the objects as you find them. If you get stuck inside any episode, hints inside the game will help you along. Even though the game can be played by children as young as eight, you must be 13 to register for an account at Pogo. 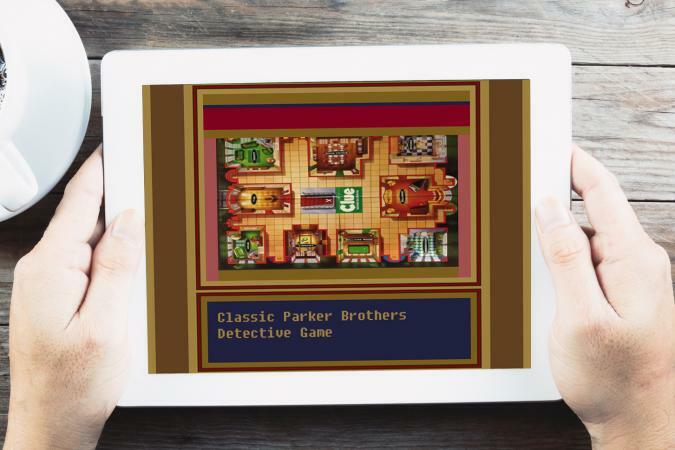 In addition to playing online, you can also play Clue on your favorite gaming system. The game is included in the third installment of the Hasbro Family Game Night series from Electronic Arts alongside Yahtzee Hands Down, The Game of Life, Mouse Trap and Twister. Though you can no longer pick up a new copy of the game, GameStop typically stocks pre-owned copies for the Nintendo Wii, Xbox 360 and PlayStation 3.